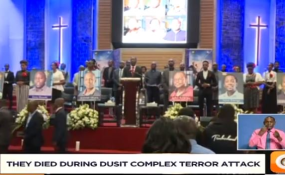 Nairobi — The memorial service for six dusitD2 hotel staff who died during the terror attack on the complex was held on Wednesday. The service was be held at the Consolata Shrine in Westlands. The six who died during the attack include Beatrice Mutua, Bernadette Konjalo, Dedricks Lemisi, Erickson Mogaka Momanyi, Zachary Nyabwanga, and Truffosa Nyaboke. On Tuesday, six Cellulant employees who lost their lives were honored at a memorial service, that was held at CITAM church on Valley Road, on a day tenants and motorists were allowed to collect their personal belongings from the complex.